Mossie notes that the locomotive appears to be in good shape cosmetically, but he is not too sure about the sagging pipework - these are likely to be plastic substitutes. These locomotives worked on the PE-Avontuur line since 1960 until the early 1990's when Class 91 (narrow gauge) diesels were introduced. They gave a good account of themselves on this line, and were affectionately known as "Kalahari's"- a somewhat inaccurate nickname. 21 engines of this Class were built in the period 1931-1958 - by Jan 1984 10 of these loco's were still used in SAR operations. SAR Class NG15 N0 NG122 in the Transport Museum at George. 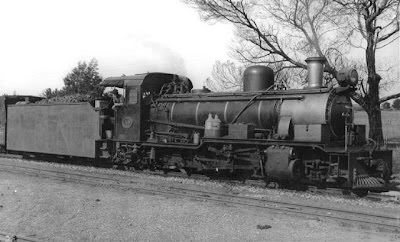 #NG122 of the Narrow Gauge Class NG15 affectionately known as "Kalaharis". NG122 was built in 1950 by the Belgian firm of Société Anglo-franco-Belge and operated in Southwest Africa on the branch line to Otavi until the conversion of the narrow gauge lines in SWA to Cape gauge. SAR Class NG15 N0 NG122 in the Transport Museum at George. Note the swing seat. 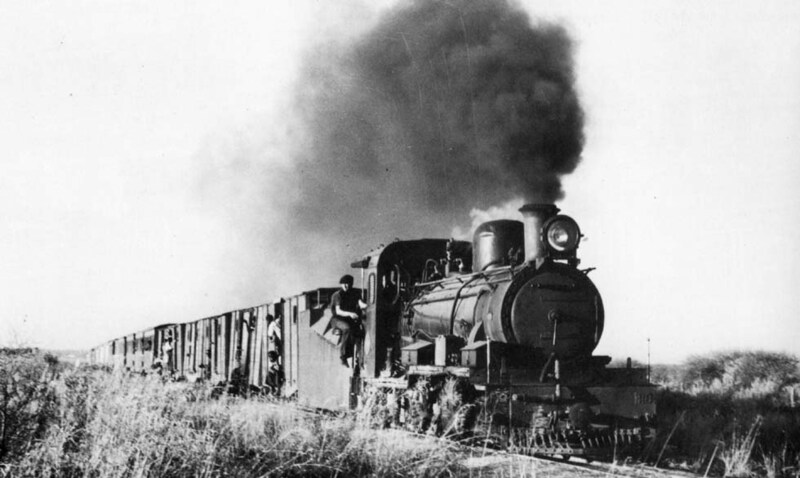 A SAR Class NG15 No 118 working at full steam on the Otavi line - No 118 was delivered in 1939. In typical fashion the driver sits outside the cab on the swing seat. The NG15 class of locomotives were developed for use on the 60cm gauge lines of South African Railways (SAR) and were an enhancement of an earlier design of 1922 that were designated NG5. 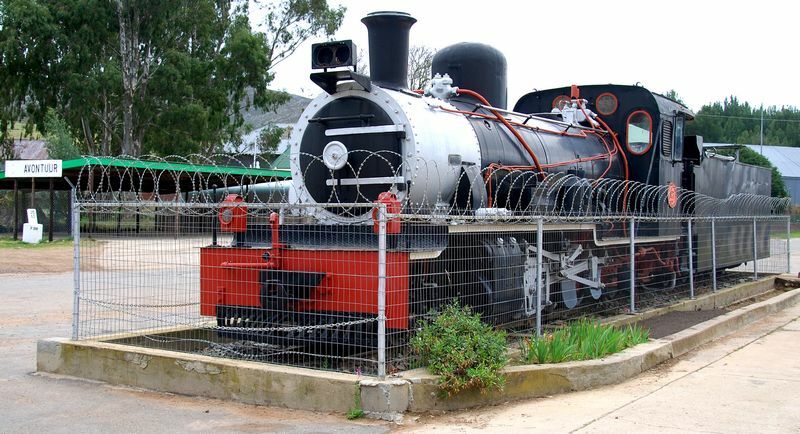 Initially the design started out as 3 locomotives of the Hd class for the Otavi Railway in what is now Namibia but at the time was German South West Africa. Needless to say these locomotives were German built being constructed by Henschel & Sohn in Kassel. The design progressed in 1922 with a further 6 locomotives, again built by Henschel & Sohn, that became the NG5 class. 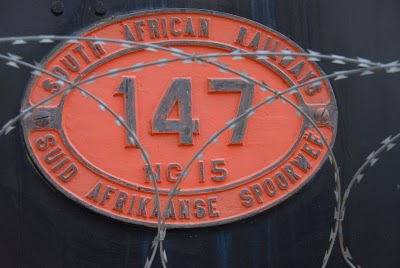 After trials of one of the locomotives on the Avontuur line the design was altered again to become what we now know as the NG15 class. 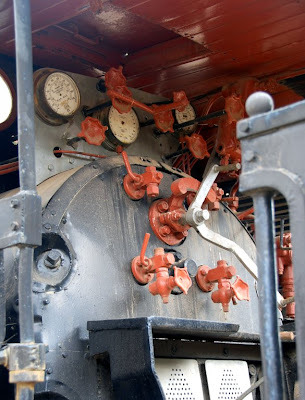 The preceding classes made use of flangeless driving wheels on one set of the eight coupled driving wheels, however this still proved unsuitable for the tighter curves on the Avontuur line. The distinctive feature therefore, that differentiated the NG15s from their preceding classes was the use of the Krauss-Helmholtz pony truck for the leading wheels. This system allows the front driving axle some sideways movement so as only the rear three axles form a rigid wheelbase. The front axle is guided around curves by the front pony truck to which it is attached via a pivoted linkage. The first four batches (totaling sixteen locos) were all for use on the Otavi system in SWA. This German built line was one of two 60cm gauge networks in the colony. At their maximum extent they totalled nearly 700 route miles. Gradually sections were replaced or re-gauged to 3' 6" but 250 miles remained from Karibib, running north east to Otavi, and to the mines at Tsumeb and Grootfontein which provided the main traffic. The route crossed the Namib, the most arid part of the vast area often loosely known as the Kalahari - Kalahari's being a nickname sometimes given to the NG15's. This desert inheritance is particularly visible in the locos' very large tenders that, as well as 2860 gallons of water, can carry up to five and a half tonnes of coal. The class worked throughout the SWA narrow gauge lines but by the 1950s the limitations of such a narrow gauge were beginning to be critical. In 1958 the fifth and final batch of five NG15s was ordered from Henschel by the Tsumeb Corporation itself, to ease the backlog of traffic. As many will know they then ordered seven NG/G16s, but by then the decision had been made to re-gauge the whole system to 3' 6", and in November 1960 the narrow gauge in SWA ran for the last time. There remained several 2' gauge routes within South Africa itself. These included a number of lines serving timber and agricultural areas of Natal province, and one carrying mainly fruit and limestone in the Cape Midlands. This latter one penetrates the Langkloof Valley west of Port Elizabeth and it was to there that all members of the NG15 Class were transferred. The line is some 180 miles long, running from PE to remote Avontuur in the mountains, and with a branch to Patensie. It traverses some magnificent scenery, but much of the line only really came into its own during the fruit seasons. There the 15s ran for another thirty years or so. They are a little less powerful than the Garratts, but a good deal simpler, they were popular with both crews and management. Regular monthly totals of 3000 miles and more can rarely have been equaled by locos on the 2' gauge anywhere, whilst the stories of 40 mph top speeds suggest smooth running too. The introduction of the Class 91 diesels, the deregulation of road haulage, and the consequent rundown of the railways in South Africa led to their being withdrawn in the 1990s. All 21 still exist (though some are in a very sorry state - see the Post Service page). Of those 21 only three are operational, No.17 at Sandstone, No.119 at the Apple Express and No.123 at the Bennet Brook Railway in Western Australia. As for the six which made it to the UK, none are steamable and of these only 134 is currently being worked on. With thanks to Martin Coombs & Peter Randall. The current (2009) status of all 21 NG15's ever built can be seen here. 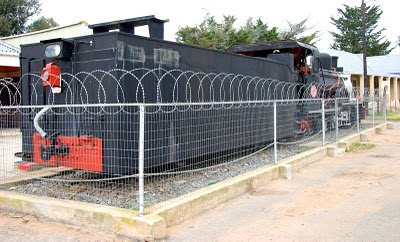 Welsh Highland Railway Society, is currently restoring to service the NG15 class narrow gauge locomotive number 134, formerly of South African Railways. This website will be tracking the restoration of the locomotive as it is brought back into active service.